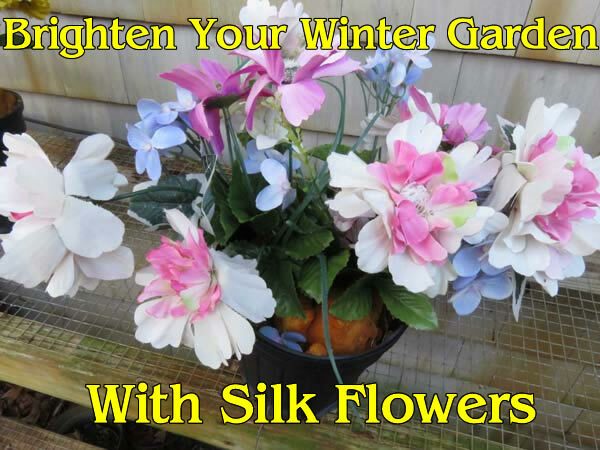 Keep your garden cheerful in winter with silk flowers. Brighten the dull season and add more cheer. Lets face it winter can be pretty bleak. It’s cold, there are no leaves on the trees the plants are not growing. Garden cleanup is as finished as it can be with cold weather upon you. But looking out the window can be depressing. All those lovely flowers have gone. Well they don’t need to be. Every summer I have a lovely patio area outside my kitchen window that is bursting with blooms it’s a delight to look at. In winter not so much, its bleak and cold. So fix it. Adding a few pots of silk flowers can really cheer up the area. Now every time you look out the window there is something bright to look at it brightens up the winter months until spring brings the green back to the world. The great thing about it is that its easy to do and not very expensive. Empty plant pots. Keeping the ones you got the plants in from the garden center or big box store is always a bonus. Some stones from your garden. Hey who doesn’t have those. Now you actually have a use for them! Some silk flowers. Get them in the dollar store. Its not necessary to use expensive ones just something bright. A can of ‘Great stuff’.Optional- some wire to put through the bottoms of the pots. The wire option can be very useful if you are intending to put the pots onto wire shelving or somewhere else they may fall off easily and could be wired into place. 1. Buy a bunch of silk flowers from the dollar store. The ones that come in mixed bunches on the same stem are the best option as they need less work. However they are not always as easy to come by these days. Whatever have great time choosing as many silk flowers are you like. Its best to pick a few more than you think you will need as its much better to have too many that not enough. Suggestion. Don’t pick Christmas flowers. It’s tempting just after Christmas to pick all the cheaper Christmas stuff but these flowers are going to be out there until spring. It may look great in December but it looks dated by March. A little holly and maybe one or two poinsettias is OK but for the most part pick spring and summer flowers. You will be happier in the long run. 2. Buy a can of ‘Great stuff” See if you can determine just how much you will need for the number of pots and buy a can the right size. Great stuff IS great BUT once you start using a can of it you have to use it all in one go. You cant leave some for later. Once started it works fine but left it sets in the can and is of no further use. So you don’t want to use half a large can when a full small can will do. 3. Sort out some old plastic pots to use. The plastic pots that your last purchase from the garden center or big box store came in is perfect. Use only plastic pots NOT ceramic. They have to stand up to the cold and fluctuating temperatures. Plastic will do this fine. Ceramic will crack over time. They are also more expensive and you don’t want to waste them. 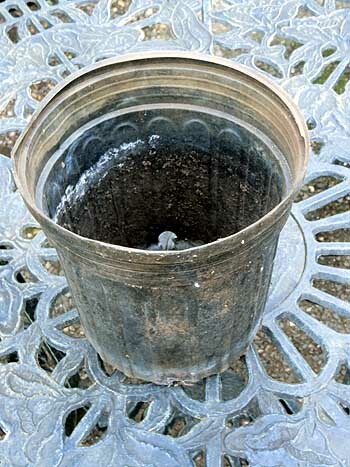 Pick pots that are not too big, unless you intend to do a large planter. Smaller pots are easier to work with and to fill with silk flowers. Pots need to be full of flowers to do their job properly so smaller pots are better. I used 5” (12 cm) pots. 4. Go find some stones. Stones are essential to keep the pots anchored. Pots need to be heavy if left outside or they will blow away in the wind. The heavier you can make a pot the better. So go out and collect as many larger stones as possible. Some people collect up stones from their garden and put them in a pile. Now that pile is finally useful. If not then a scavenger hunt around the garden will be in order. Use larger stones Make sure that they cannot escape through the holes at the bottom of the plastic pots. If stones are that small discard them. DO NOT use soil! It’s tempting but the great stuff will not bind the soil together and it will leak out the holes at that bottom of the pot as it dries out. Pots can leak soil for years. Trust me I made this mistake with my first set of pots. Don’t make my mistake leave the soil on the ground and use stones. For those in warmer areas, or if you have had time to plan in advance. You can use concrete to do this job. However if you left it too late and its cold the concrete will not set. Also it’s harder to keep the flowers in the correct upright position until the concrete sets. Thus “great stuff” is the best fast option. 5. Divide up your silk flowers. Decide which flowers are going into each pot and divide them up. If you are intending to do a large planter then it would be best to determine how the flowers will be placed before you begin. Plan out which flowers go where. There will not be much time to change your mind when you start working so figuring out your layout beforehand is essential. 6. Wire. If you are going to put your pots onto wire shelving or in an area where the pots may easily be knocked off then using wire at the base to keep them in position is a good plan. Use a thicker gauge wire. That found in wire coat hangers is ideal. If you have wire ones from the dry clearers perfect (another good way to recycle and reuse). If not buy as spool of similar gauge wire from your local hardware store. 1. OPTIONAL. If using wire cut the wire into lengths depending on the width of the pot and how much you need to wire it down. Usually a 24-36” long piece is ideal. If using a coat hanger cut the looped piece off the top of the hanger and flatten it out. Thread the wire through two holes along the bottom of the pot. In one side out the other. Make sure that the pot is centered on the wire. 2. 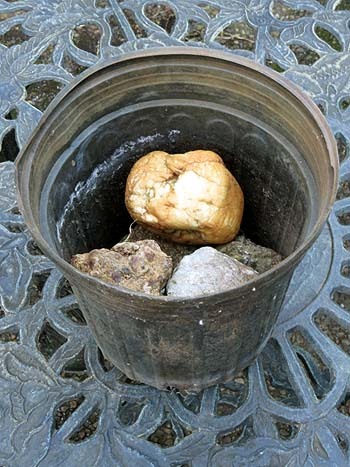 Fill all the pots with stones to about ¾ of the way to the top of the pot. Shake the pots or tap them on the work surface to ensure that the stones are settled well in the pots you don’t want them shifting later. 3. Lay out your flowers ready for each pot. Know exactly what you are going to put where. Check that they will fit where you want them in the pot of stones and cut down the wire stems if necessary. 4. Get your can of “Great stuff” put the thin nozzle on the end and get the can ready to go. If you have not used this stuff before be aware that it will foam up and expand a lot once its in the air so take is slow when using it until you get the hang of it. 5. Stick the nozzle down amongst the stones and gently press the top. The idea is to get the great stuff to stick the stones together. Work it in from several angles using just a little. Once the stones are in place add a little more on the top to fill the pot up almost to the surface. Great stuff fills the pot and hardens quickly around silk flower stalks. 6. 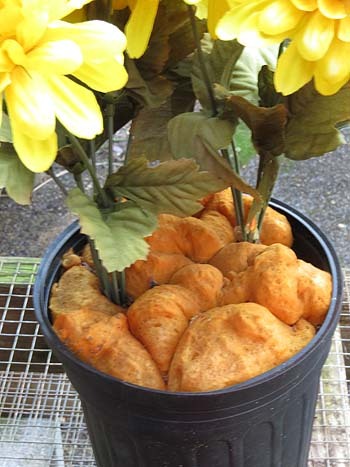 Quickly place your silk flowers in the pot and hold them in place. Great stuff sets fast so you will only have moments to do this arrange the flowers as you want them to appear. Remember you can always bend the stems around once they are set in place. 7. Move on to the next pot and repeat the process until you have finished all the pots. Work each pot from start to finish as you wont have long before the “great stuff” sets. Don’t take too long on each pot or the great stuff can stick in the can and become useless. 8. Once all the pots have set you can bend the flowers around to cover the great stuff in the pots and make the flowers look their best. 9. Place pots around your garden outside your windows where you can see them when you look out and brighten your winter. 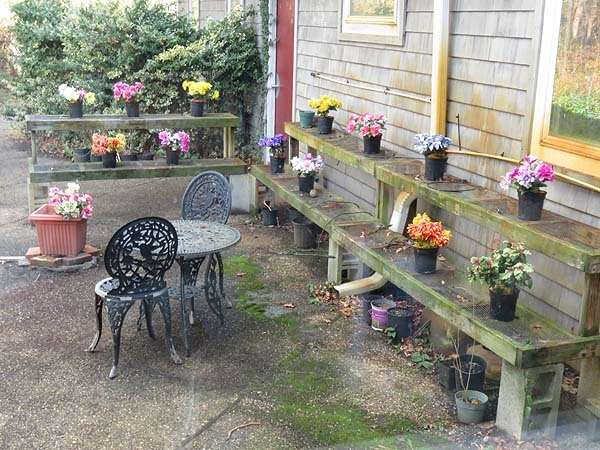 Patio decorated with silk flowers looks much more cheerful for winter months. These pots are wired in place or the blow off in strong winds. When spring comes pots can be taken in and stored until next winter. Once created these silk flower pots will last for years. My first set lasted me ten years before they finally broke apart and had to be replaced. 1. 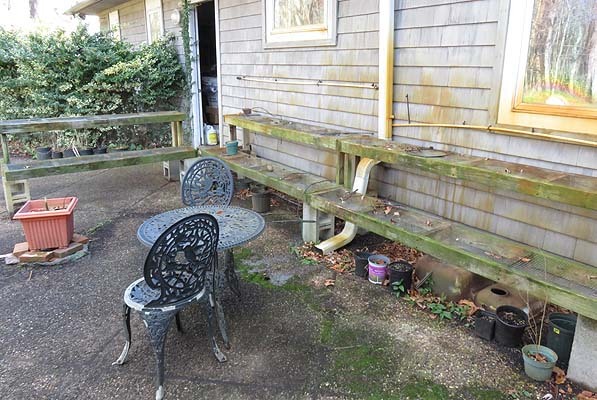 Don’t put pots under downspouts or other areas where lots of water will runoff the roof. The water tends to drop on the plants and freeze then you get silk flowers encased in ice. They don’t last as long this way. 2. If pots are placed in a precarious position or on shelving wiring them down can be an excellent idea. Strong winter winds can lift up pots that you thought were heavy enough and blow them away. Its not fun having to chase them around in the dead of winter. Also if you have pets that might knock them off wiring down might be prudent. 3. If you choose to make a large planter remember first that this is permanent. Once the great stuff is in there you can’t take it out so don’t use a favored planter that you want to use again in summer. If you do want to use a favored planter then choose a separate pot that is just a little smaller and put your display in that, then drop it in the planter. It can then be taken out in spring and replaced until next winter. 4. If using a large planter not as many stones will be necessary. If you fill it with stone you won’t be able to pick it up and move it later. However still don’t use soil as the great stuff will not bind to it and it can cause the display to break up. A good way to fill a planter is to use layers of polystyrene packing chips or chucks of polystyrene packing that came you’re your last purchase. If doing this test the “great stuff” on your chosen material before you start some products will react with it and may dissolve. DON’T use starch packing chips they will certainly dissolve. Mix the material with stones and bind it together with the great stuff. Work in layers until you reach the top of the planter. Make sure you use enough stones to give the planter enough weight that it wont be blown over by strong winds but still light enough for you to carry around. Make sure you experiment with the flowers and decide how you want them arranged in the planter before using the great stuff. You won’t have a lot of time to work once it’s out of the can before it sets. Let your artistic side roam free and create some bright interest for your garden this winter. Author Janice Hazeldine PhDPosted on January 14, 2017 Categories garden concepts, Garden workTags Brighten winter garden, how to brighten winter, silk flowers garden, winter gardeningLeave a comment on Keep your garden cheerful in winter with silk flowers.